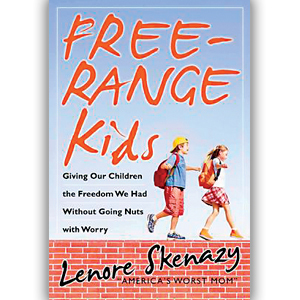 The idea behind Lenore Skenazy’s book, Free-Range Kids, is to help parents see some risks are worth it. My three favorite “commandment” to raising safe, self-reliant children without going nuts with worry are study history, relax, and fail. Skenazy urges parents to remember that in the past “your ten-year-old would have been forging horseshoes or at least delivering papers.” She reminds readers that until recently, adults depended on children for survival, be it through chores in the field or around the house. Competence, not age, determined the responsibilities children acquired. It was the idea being everyone needed to earn their keep. After all, she notes, “Until the recent advent of small families, it was often the older sisters who took care of the kids who came along.” Sure enough, children survived the early onset of independence. While a kid’s capability hasn’t changed, our society’s perception of just how much freedom a child should have has. If you love your child, you must restrict her to keep them safe, right? Well, that’s what Skenazy argues the “blamers” would say; however, she claims, “They don’t know your kid like you do.” According to Free-Range Kids, “This eagerness to distrust each other and even to find glaring fault with each other means that it’s hard for moms and dads to relax, too. If the only good parent is a parent who never leaves their kid’s side – not even to run to the back of the store for a can of tuna fish – then it’s very easy to spot the bad ones.” As a result, Skenazy insists things that previous generations would have done without a moment’s hesitation are now fodder for the gossip mill. Part of the problem is, according to Skenazy, that we buy into two incorrect assumptions. One – children are wet clay at birth and need to be molded into something special quickly. Two – they need more attention than ever before if they are going to end up smart and successful. Skenazy quotes Kathy Hirsh-Pasek, director of the Temple University Infant Language Laboratory and coauthor of Einstein Never Used Flashcards, “Everywhere we’ve looked, the children are not gaining any advantages from these extra edutainment activities.” Success, instead, is largely based on nature. If you want to nurture something in your child, skip the skill and drill. Focus on persistence and promote curiosity. Need a little more convincing that free-range kids become self-reliant adults, try watching this video called Famous Failures. It might just inspire you to give your child the freedom she needs to succeed on her own.